Nebula Collection by Bestar is the ideal solution for organizing small spaces with multiple purposes. With crisp, modern lines, create your dream layout by combining the different units to meet your needs according to the available space. This kit includes two 25 inch storage units, two doors, a base unit and a bridge. Each 25 inch Storage unit has 2 fixed and 3 adjustable shelves to maximize your options. The base unit has 1 adjustable shelf. The reversible doors provide closed storage on bottom or upper section of the storage unit. 6 clothing rods are included in this kit. Easy to install. Assembly required. Pro-Linea has all the elements to create a modern and refined work environment. The clean lines of this collection bring a fresh look without compromising functionality and durability. The Credenza is made of a durable 1 inch commercial grade work surface with melamine finish. The Return table features a deluxe impact resistant PVC edge. The credenza features three shelves, two of which are adjustable for additional flexibility. The hutch for credenza offers large storage spaces. Square metal legs in matte silver finish. The Legs feature levelers to adapt to any floor irregularities. This unit meets or exceeds ANSI/BIFMA performance standards. 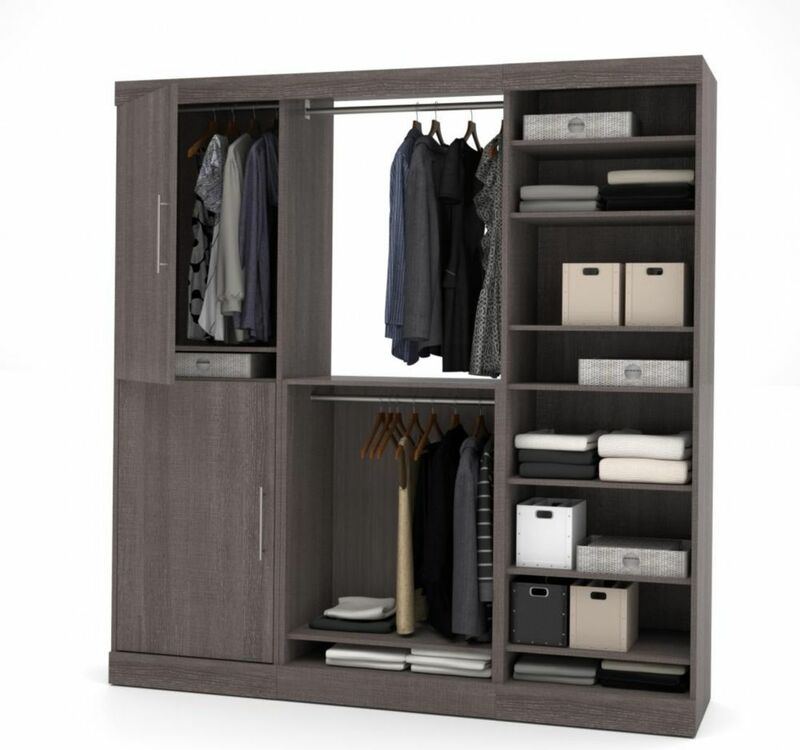 Nebula 80 inch Storage kit - Bark Gray Nebula Collection by Bestar is the ideal solution for organizing small spaces with multiple purposes. With crisp, modern lines, create your dream layout by combining the different units to meet your needs according to the available space. This kit includes two 25 inch storage units, two doors, a base unit and a bridge. Each 25 inch Storage unit has 2 fixed and 3 adjustable shelves to maximize your options. The base unit has 1 adjustable shelf. The reversible doors provide closed storage on bottom or upper section of the storage unit. 6 clothing rods are included in this kit. Easy to install. Assembly required.